Are you looking to drive HGV LGV articulated lorries, driving licence category C+E? Do you already hold a full Class 2 Category C licence? Let TrainDrive provide you with the training you need to obtain the driving licence category required to drive a class 1 HGV / LGV. CPC Periodic Driver Training – remember to stay legal – You must remember your Periodic CPC training to stay legal. Click the link for more information. Click to check your CPC hours on the GOV website – Do you need to check your check your Driver CPC periodic training hours online? Start now. HAVE ANY QUESTIONS ABOUT OUR HEAVY / LARGE GOODS VEHICLE DRIVER TRAINING? Class 1 or Category C+E or Articulated lorry training takes place in the largest of our LGV / HGV training fleet. LGV / HGV drivers are always in demand. Suppliers or hauliers need to transport goods from A to B and that requires a driver too! We provide training courses to suit the individual and these come at a very competitive price. Passing any driving test is important. We’ll do our best to make sure you pass because it’s important to us too. 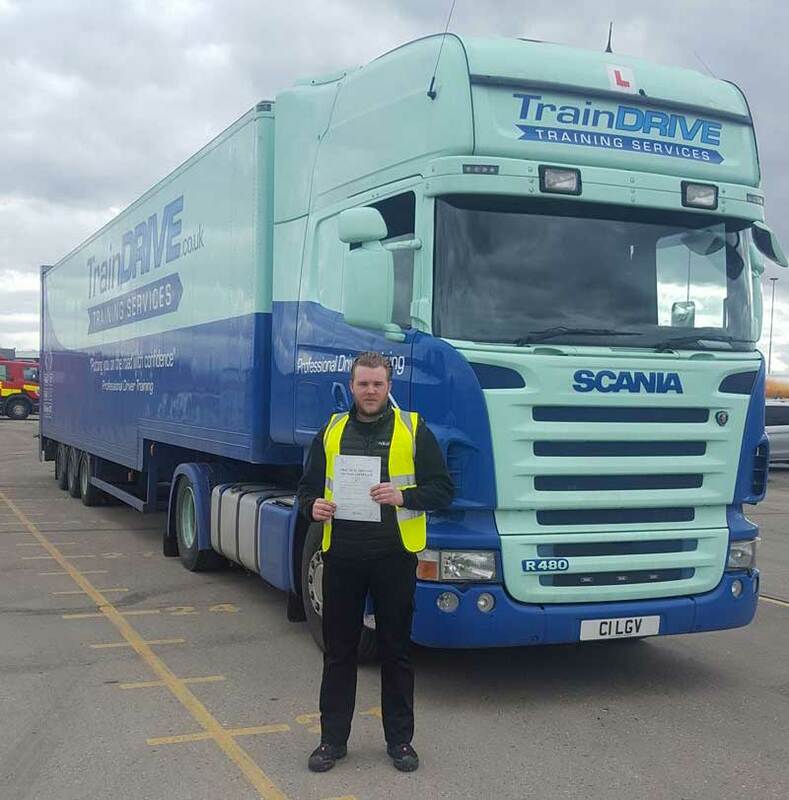 Why use TrainDrive for your HGV driver training? We operate a fully serviced full-sized 40T Scania R Series 480 Topline with a tri-axle box trailer for this course. As a result, this ensures that your training gives you valuable experience in a full-sized vehicle, representing the reality of your first day of employment. TrainDrive courses are behind the wheel, on the road training with DVSA Advance Driving Instructors. The ratio of trainee to trainer is usually 1:1. Alternatively, you may choose a 2:1 training course for a longer period. Finally, don’t forget your Periodic CPC Training to stay legal! Need to drive a Horsebox? If you are looking to drive a horse-box? It is likely you will need a separate vocational driving licence category to be able to drive it legally on the road. It depends on the size and type of the horse box you want to drive. For a Car and small Horsebox Trailer you will require a Category BE driving licence which we are able to offer. For Smaller Horsebox self contained units between 3.5 and 7.5 tonnes you will need a Category C1 driving licence course. For the larger HGV size Horseboxes these ones are the biggest and due to their size of more than 7.5 tonnes, you will need a full HGV LGV Category C driving licence course. Once you have decided which is the appropriate one for you, then get in touch with us for more information. Alternatively, use the Booking Form to get going.